You can usually make it for less money than you can buy it. You can customize the colors to get exactly what you want. You control the ingredients, so you know they are safe! The exact amount of the ingredients is not critical, so feel free to experiment. The corn starch is a non-toxic binder that helps stick the paint to your skin. It also provides a reflective surface to increase the brightness of the glow. The cold cream or lotion gives you a smooth “paint” consistency and keeps your artwork flexible so it won’t crack or peel. The critical ingredient is the glow pigment, since this is where the “glow” comes from. If you’re mixing up several different colors, stir together the corn starch and cold cream and divide it up into an ice cube tray or empty egg carton to make a convenient color palette. For a single color, simply mix together the corn starch and cold cream in a small bowl. Mix in the glow pigment bit by bit. It really helps if you have a black light or a very bright light hand so you can charge the glow pigment, turn out the lights, and see how the paint looks. Adjust your consistency. Add more pigment to get a brighter glow. Once you are happy with the glow, you can add a bit more lotion or cold cream for a smoother paint or a bit more powder for a drier and stiffer paint. Cover the glow paint with plastic until you’re ready to use it. If you like, you can refrigerate it to make it easier to apply. 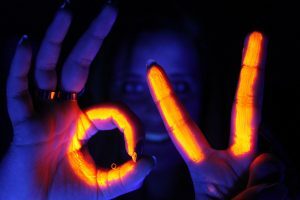 Use make-up sponges, fingers, or paintbrushes to apply the glowing paint. Some glow pigments are already colored, giving you a colored paint. Note the color of the pigment in normal light may be completely different from the color it glows! If you want to add color to the paint, you can add food coloring or powdered paint. Keep in mind, adding color pigment will reduce the brightness of the glow (blocks the light) and also, if you use any water-based product you can diminish the glow (most glow pigments are damaged by water). One solution? Apply regular colored face paint and then add uncolored glow paint over it. The color will still show through and the glow won’t be diminished. Ordinary soap and water will remove the glowing paint. Whether the color from dyes is removed depends on what you used. 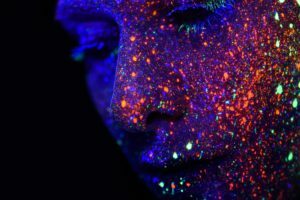 Make sure your glow pigment is “glow in the dark” or “phosphorescent”, which is different from “UV glow”, “fluorescent” or “black light glow”. Powder the truly glows in the dark will also glow under a black light, but it keeps glowing when all lights are out. Glow powder comes in different particle sizes. The larger the particle, the brighter the glow, but bigger particles also mean you’ll get a gritty paint. Decide how important brightness and glow time are compared with paint smoothness and choose accordingly. In addition to particle size, the brightness and duration of the glow depends on its color. Green and blue pigments glow the brightest and last the longest. Other colors fade relatively quickly, although you can recharge most of them with a black light or your cell phone flashlight (or you can just rock a black light party and not worry about it). For the absolutely best and brightest glow, apply glow in the dark paint over white or silver paint. The base paint will reflect back the light. Glow powder hates water! Unless you buy special encapsulated pigment (sealed against water), you’re going to lose the glow by adding water or too much water-based colorant to your face or body paint. Yes, there is some water in the lotion or face cream. It shouldn’t be a problem if you make the glow in the dark paint fresh before using it. I’d make and use it the same day. Another option is to use the white face paint recipe and mix in some glow powder. This recipe calls for solid shortening in place of cold cream, so it may work better if you have sensitive skin. Coconut oil is sufficiently solid at room temperature to work for this project. can we use highlighter liquid ?